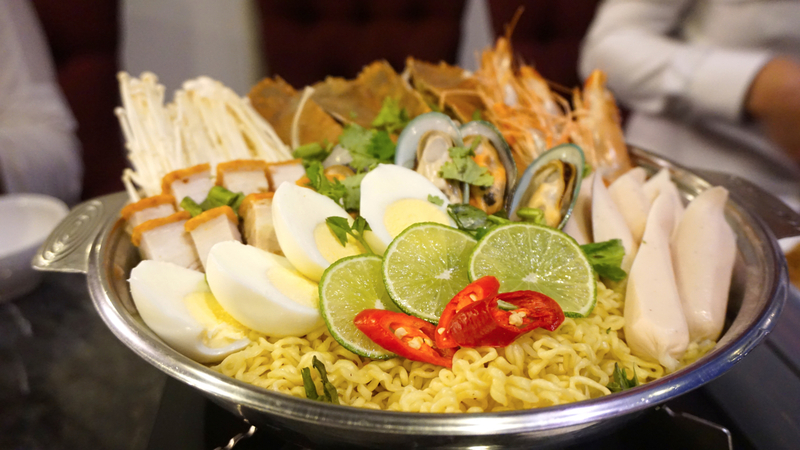 Tucked in a quiet corner of Bukit Merah, the people responsible for Atmosphere Bistro have birthed authentic Thai hotpot in the form of Soi Thai Soi Nice. You’d think that a restaurant located in that particular heartland of our teeny tiny island wouldn’t put in much effort into their food, but you’d be thinking wrong. After all, this upstart Thai restaurant is headed by Chef Worawong Phairat (Olay) from Bangkok with 19 years of kitchen experience, and an emphasis on authenticity of recipes and focus on ingredients. 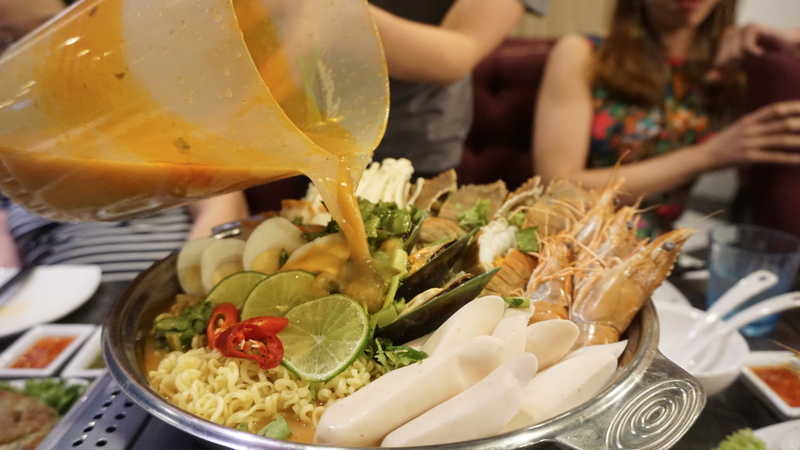 So, the key thing about Soi Thai Soi Nice is its focus on Thai hotpot. In that sense, they want to encourage people to get together and dine. 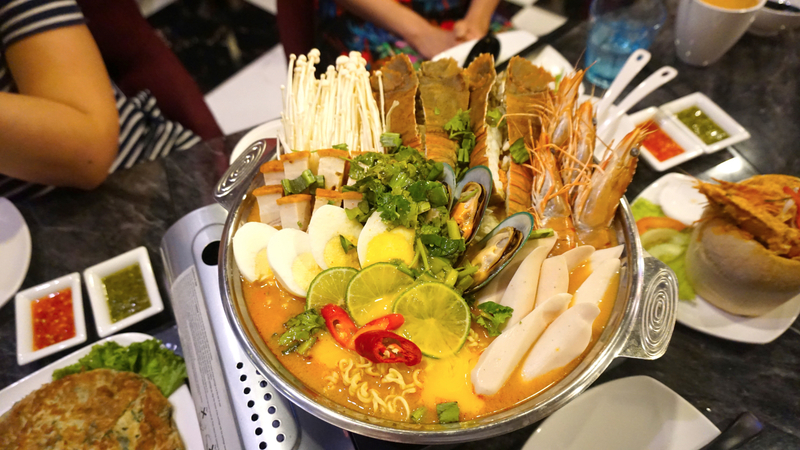 There’s always plenty of interaction when it comes to communal meals like hotpots, and you’re going to need that team to take down this Royal Thai Hotpot (Big – $68.80, feeds 4). It’s the smorgasbord you’ve come to expect from a modern hotpot experience, so the crayfish, prawns and all those other what-nots are all in there. This dish is all rather typical-looking, until you hit the soup stock. The flavour profile is clear as day: lemon grass fragrance, spices, and then a note of sourishness tells the tale of an authentic Tom Yum Soup. It’s appetizing, easy to drink, and warms the soul. We didn’t take the ultra spicy version, but if you are a fan of spices, please go for it! 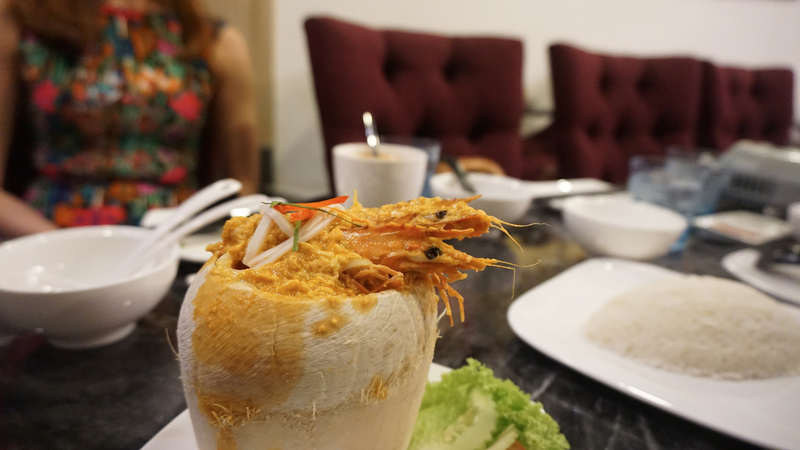 The other standout is the Coconut Seafood Otah (Hor Mok Ma Praw Talay – $12.80). This is what all great seafood otahs should be: slightly milky from the coconut, but heartily spicy and filled with chunks of seafood. I really like this, because it is so deceptively simple-looking. I could just have this dish with rice, and I’d be a happy man. Everyone is all about the hotpot, but I personally feel that their grilled meat items made the difference here. 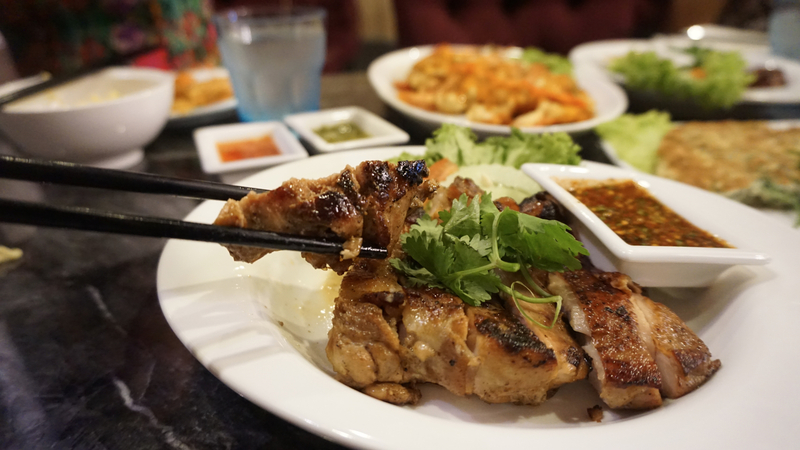 First off, we’ve got the Grilled Chicken Thigh (Gai Yang – $$8.80). I adore the juiciness of this chicken dish, and love how there’s just a bit of char when I bit in. I also think that the chef treated the chicken well. This one gets my two thumbs up, but not my undying endorsement. 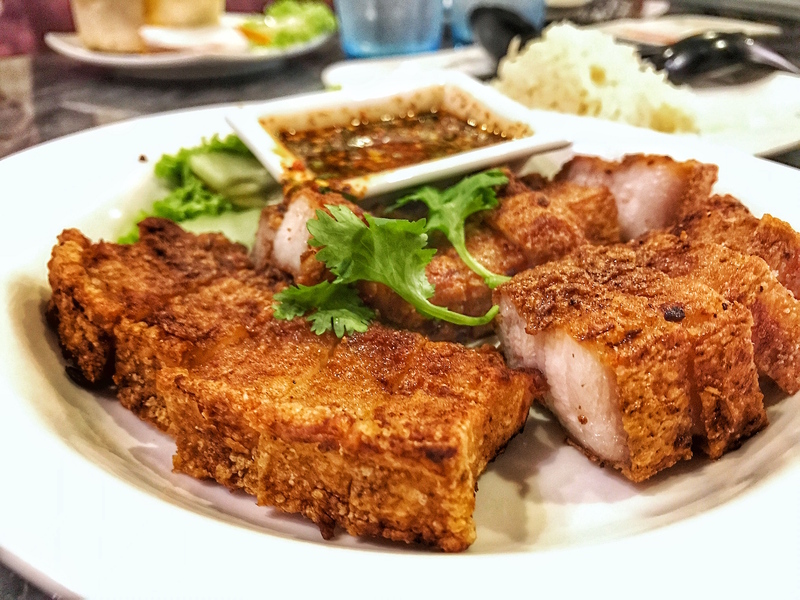 Not that the chicken wasn’t good, it’s just that the Deep Fried Pork Belly (Moo Sam Chan Tord – $9.80) was amazing. Now THIS gets my complete and utterly undying endorsement. A lot of you saw this one on Instagram, and it was indeed my pick of the night. This pork belly gives a bit of resistance when you bite in, so you get that initial crunch from the skin, followed by a saltiness that keeps you wanting more. Few things would beat the pleasure of spending an entire night with just this pork belly and a bottle of beer. It isn’t Thai food without sweet desserts, and everyone knows that you can’t go wrong with some Mango Sticky Rice (Kao Niao Ma Muang – $5.80). 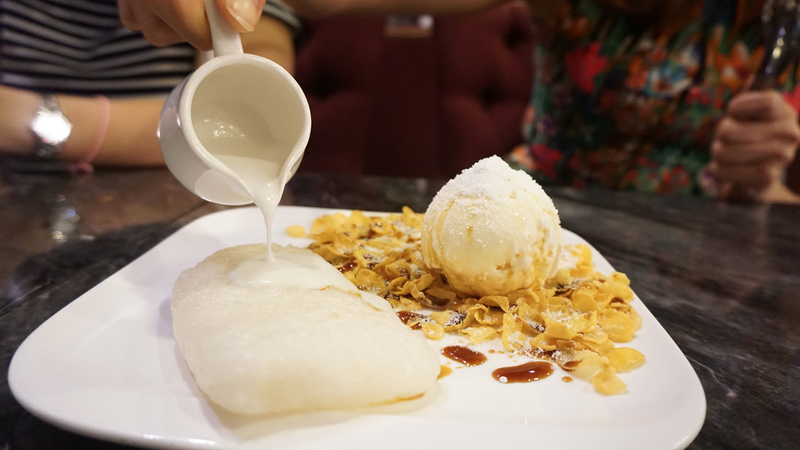 But I’m not going to talk about that, because we’ve got something better: Sticky Rice with Coconut Ice Cream (Kao Niao I-Team – $5.80). This baby is an uncanny, but remarkably well-paired. The uniformly warm and sticky rice went so well with that creay coconut ice cream. Throw in that drizzle of Gula Melaka, and you have a heavenly dessert. As a testament to how good this dessert was: I had two mouthfuls before the ladies at the table swooped in for the rest of it. I keep saying this: The location that Soi Thai Soi Nice is at, isn’t doing its food justice. But you can, if you make it a point to drop by and have a meal here. Don’t let this one slip by you. This actually looks pretty darn good. Agreed that it’s a bit out of the way though!